It’s so refreshing to watch heroes and villains who are over the age of 40. 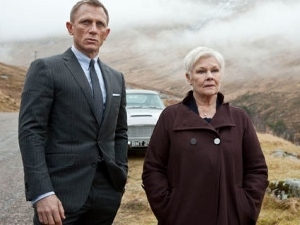 Skyfall repeatedly suggests that sometimes older is better, and I couldn’t agree more. Daniel Craig’s third turn as James Bond is at least as good as his first, Casino Royale. Javier Bardem makes an excellent villain and we also get to enjoy Judi Dench in a full co-starring role as M this time around. Director Sam Mendes (American Beauty) and director of photography Roger Deakins deliver one of the prettiest Bond pictures ever made, and Adele’s opening track fits perfectly into the canon of memorable Bond title songs. Highlights include a spectacular subway crash and an entire third act in a desolate, frozen moor. Long-time Bond fans will appreciate returns of characters not seen in a while, as well as the iconic Aston Martin and the famous James Bond theme music.